What is Jackfruit? We were wondering the same thing! It turns out that jackfruit is the largest tree fruit in the world and it also happens to be sweet and is packed with nutrients. A species of tree in the fig, mulberry and breadfruit family, it is a rich source of vitamins, antioxidants, minerals, phytonutrients, carbohydrates, electrolytes, fiber, fat and protein. This fruit also contains no cholesterol or saturated fats. Another major bonus of jackfruit – when prepared properly it makes a damn good substitute for pulled pork, the texture is surprisingly similar, it even “shreds”, and it takes on the flavors you prepare it with. This is a vegan and plantbased dining dream and taste delicious. Phytonutrients may be another term you are unfamiliar with. When the men in white coats talk about the benefits of broccoli, mustard greens, red wine, chocolate, grapefruit and green tea, the part of the food that they’re talking about is due to the bitter chemicals, they’re called phytonutrients. Bitter foods actually have a natural toxicity about them and they act as a natural pesticide to the plants they are a part of. But hang on, how can they be healthy if they have toxic elements? Well that’s the thing, the reason they’re healthy is because they are slightly toxic and can destroy things like cancer cells. That is why a diet rich in the phytochemical, quercetin, (found in apples, onions, broccoli and citrus fruits) is so beneficial to help protect against some cancers. 1. Drain and rinse the jackfruit. Press moisture out and pat dry. 2. Heat olive oil in a large sauté pan over medium high heat. 3. Add onions, bell pepper, and pinch of sea salt. 4. Saute until softened, then add the jackfruit and remaining seasonings with garlic and lime juice. 5. Reduce the heat to low, add 1/3 cup water or vegetable broth and allow mixture to simmer minimum 30 minutes. Taste and adjust seasonings. 6. While jackfruit simmers, prepare toppings. Finely chop cabbage and mix with chopped cilantro and chopped onions, drizzle with olive oil and a pinch of sea salt, stir. Cut avocado. 7. 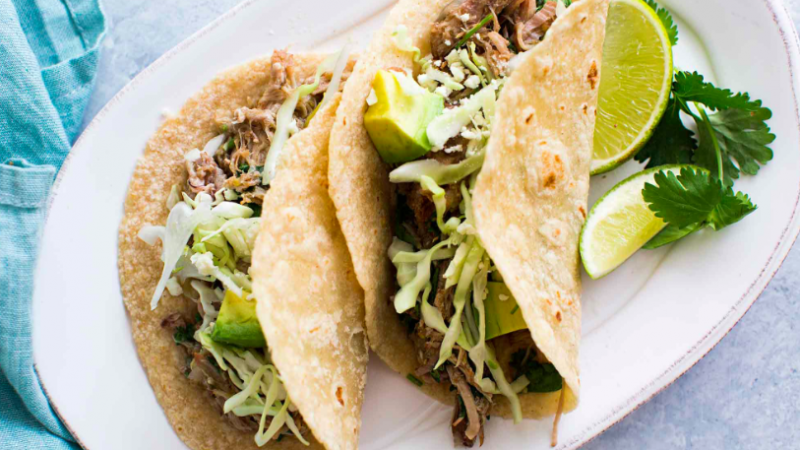 Serve jackfruit over warmed corn tortillas. Top with cabbage mixture, pico de gallo and slices of avocado.